In its purest form liberal internationalism holds that a man may live anywhere he wishes and owe no particular allegiance to any people, place or society. In theory, although not in practice, it is an imagined universe in which the individual is supreme in his atomistic and egoistical desires and the nation state no more than an administrative adjunct to his life. In practice, the liberal internationalist says that you may behave as you wish provided your behaviour meets politically correct "absolute" values. If liberal internationalism was merely the eccentric philosophy of those without power it would be no more than another utopian curiosity. But it is the present ideology of Western elites. Through their control of politics and the media they have sufficiently translated into reality this fantasy of the world as a place of undifferentiated settlement to the point where it has severely disrupted every Western society. The engines of the disruption have been immigration on a grand scale of peoples unwilling or unable to assimilate, "globalisation" of trade and industry and an elite propaganda regime, totalitarian in its scope and intent, designed to decry native Western cultures and de-culturalise native Western populations by denying them knowledge of their past, whilst promoting the interests and cultures of the immigrant. To these ends Western elites have abused their control of the law, the media, public policy and state education. They have created a situation whereby no one may hold a public position without at least paying lip-service to their creed. Why is liberal internationalism is so dangerous? The liberal internationalist view of the world is vicious because it is completely at variance with the social instincts of Man, which invariably express themselves in some form of tribal organisation, whether that be a band of fifty people roaming the plains of Africa 10,000 years ago or a modern nation of many millions. Men have an absolute need to feel part of a community with which they identify naturally and ideally wish to possess a territory which they can call their own. That is why empires invariably decay and territorial states are virtually indestructible, short of an act of genocide. In short, treating a country simply as no more than a convenient place of residence is a short and certain route for social disaster. Ultimately a nation state only exists because its inhabitants both have a shared sense of identity, a common historical heritage, and a willingness to defend the interests of the country, including in extremis fighting for the country. Destroy the ethnic and cultural integrity of the inhabitants and you destroy the nation state. The ultimate consequence of no sense of place is no place. A homogeneous society, a true nation, engenders a natural loyalty among its members: a society in which ethnic groups compete for space, the type of "multicultural heaven" envisaged by the liberal elite, results invariably in a first loyalty to the particular ethnic group to which you belong rather than to the nation. Beyond the common ethnic bonds and cultural sharing which glues together a nation, the nation state is also the only social vehicle for delivering a degree of democratic control to large societies. Such democratic control in turn allows the nation to retain its integrity by such measures as restricting immigration. As a society becomes ethnically fragmented it loses its natural ballast. Civic citizenship becomes the only thing which liberal internationalist governments can hold to as a unifying force. But civic citizenship is a conscious human construct and is no substitute for the natural loyalty engendered by the tribal loyalties of the true nation. Why should the nation state favor its own members? It makes moral and prudential sense for any society to both secure the loyalty of its people with guaranteed privileges which are not extended to foreigners and to reduce the opportunities for social friction. The modern nation state that is Britain, for example, confers great privileges on those who are part of it. It provides a secure environment based on the rule of law, a decent material standard of living, healthcare and education free at the point of use and, in the form of the welfare state, a safety net for those who fall on hard times. It is, in short, a very efficient life support system which most people in the world are desperate to become part of by hook or by crook. passing effective political control on many major issues from Westminster to bodies such as Nato and the WTO or the EU Commission. The nation state has failed the British in these matters. Thus, we can see that the state owes more to its citizens than such things as maintaining order, defending its borders and providing welfare provision. It must provide the cultural and ethnic structure within which these can be achieved. If either immigration or the export of jobs — both under the control of governments — make a man redundant or force down his wages, the affected individual can scarcely be blamed for feeling that his government is not merely failing to represent his interests but is actively damaging them. What incentive does that man have to feel an absolute commitment to his own society? He will be bound by his ties of family, friendship and cultural imprinting, but what he will not feel is any sense that he is something more than a human atom within a society which has no particular interest in him at best and is actively hostile to him at worst. This will produce ever greater selfishness and unwillingness to engage in social support because instead of the welfare state providing help for those with whom a natural affinity exist, it begins to be seen as simply a feeder of competing ethnic groups. Where, as often happens, ethnic minority groups are seen to be taking more than a proportionate share of the welfare or, in the case of adult immigrants, receiving welfare when they have contributed nothing the resentment is greatly increased. More fundamentally, if an elite constantly tells the mass of people that their culture is worthless and their history shameful, whilst constantly promoting the interests of immigrant peoples and cultures, it inevitably has the effect of creating disorientation in the mass of people and weakens national cohesion. To maintain a clear distinction between natives and foreigners — which requires a strict control of immigration. To protect the industry and commerce of the country sufficiently to both provide employment and for the strategic reasons of self-sufficiency in vital goods and services. To spend taxes in ways which only benefit the country and its members directly. To ensure the maintenance of democratic institutions, in particular by avoiding entanglement in international treaties which emasculate democratic control. To facilitate the promotion of a knowledge of the country's culture and history above all other cultures and histories. The individual should feel himself to be a natural member of the nation. The individual should not see himself as part of a group which owes its first loyalty to that group rather than the nation. The individual should give preference to his fellow countrymen. The individual should defend his nation against foreign abuse. The individual should be willing to sacrifice his own interests where these clash fundamentally with the interests of the nation — most dramatically he should be willing to fight and die if the homeland is attacked. Generally, the individual should always act to protect the interest of the nation. The interest of the nation can be normally determined by simply reducing any given national choice to the analogy of a personal choice in the individual's private life and asking what the individual would do in such circumstances. The obligations of government and the individual described above are the ideal for the security of a nation state. Of course, no society will ever achieve such perfection, but the nearer a society approaches the ideal the more secure the society and the happier its members will be. Conversely, the further it strays from it, the closer to civil war and fragmentation will come. She's the only white! This photo is proof that Multiculturalism is the rising tide of color against white nations. 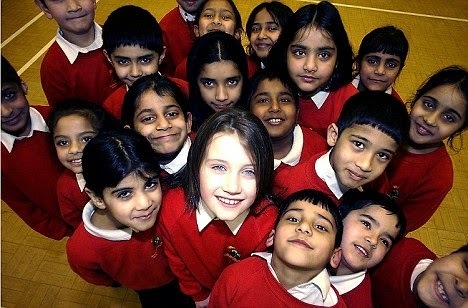 "Typical racial make-up of an inner city British school"
There are also many places in Canada that look just like that disgusting picture above. Toronto and parts of the surrounding GTA is a (racial) disaster. No one respects a cuckold. Mass immigration is cuckoldry. White males are transformed into cuckolds, White women into prostitutes, and Levantines are the pimps. Even Hungary, which used to be oppressed by the USSR, is infected by Cultural Marxism. The one word missing in this otherwise excellent review is the word 'race.' Nation states are, or were, ethnically related by blood. Thus the "natural loyalty among its members" is a racial as well as a social bond. The central fallacy of Progressivism is that laws can exist outside of culture and race. The way I put it this: law is codified culture and culture is the accumulated habits of social groups. Thus, law is designed to reinforce social norms. Progressives have this exactly backward. They believe you can start with law and through it create culture. That is why Progressives are all statists: they know they'll have to use coercion and force to get their way. Conservatives, on the other hand, are largely libertarian. They know if they live in a homogenous society, they won't need many laws to reinforce social norms. What I can't understand is how our elites have forgotten this lesson, given that they only became that way due to the unique circumstances that created Western (read English) customs, laws and freedoms. Great article. I agree entirely with Mr Robert Henderson's ideal of the nation-state. I know that among some of the 'trendier' elements of the alternative Right (Radix Journal) it's often claimed that the nation-state is an anachronism and on it's way out, however I see no evidence of that being either inevitable or desirable in any way. Anyway, if might play devil's advocate for a moment, with regards to the ideal requirements of the nation-state. What does one say to native national minority? After all, there will always be, particularly in Europe, with its rich ethno-cultural landscape and history, communities too small to form nations of their own. Do we take the old fascist position and demand that they assimilate? I myself have a rather romantic and probably impractical view, but I'd like to see Europe as a collection of federated communities, each retaining their own unique local character. Imagine how much more interesting travelling across Europe would be if there were an officially Alsatian-speaking polity, an officially Galician one, a Friulian one, etc., but it doesn't seem very practical does it? Incidentally, what was your opinion on Scottish independence? A picture of white Genocide. This is a crime. Politicians past and present need to pay for this. YOu can;t simply be in office or the beaurocratic elite and exploit your way to benefits at the expense of a people. For the most part, I would have to agree with all the comments above. Indeed, this is a clear and highly readable article, which for the most part, outlines how many people feel these days. The thing that I don't understand is why people think that the controlling elites have forgotten certain fundamental principles. I think it's more to the point to say, that they truly don't care, because they have a sense of future complete oligarchical control. A new feudalism, if you will, brought in under the false cover of globalism and a new world liberal order. When one looks at the ventures and research that has been funded by people like the Rockefellers, the last will and testament of Cecil Rhodes, the public statements of Bill and Melinda Gates, the writings of Bertrand Russell, Aldous Huxley etc.. The picture that starts to emerge is one of a new chain of being with the ruling oligarchs sitting in the position of God in the old Christian version. What else can one make of Ray Kurzweil's " merging with the machines" Darpa and Boston Dynamics drone technology, NSA hubs spying and conducting surveillance on all electronic communications in N.A. and so forth and so on. The fact of the matter is that, oligarchy doesn't care about a future with a renaissance for humanity; it's sole preoccupation is with perpetrating oligarchy. The planet is being led by psychopaths, no different in their vein intentions than their earlier historical crowned heads of Europe as well as elsewhere. Liberalism is nothing more than a false cover being served to a servile class who lack the thinking skills necessary to understand the forecast intended for them - Cheers!!! All I would add though, is that the psychopaths have plenty of help from the idiocracy, which includes the so-called educated, who toil diligently on behalf of the oligarchy, often unwittingly, in the media, academia, bureaucracy, etc. These people, are for the most part, beneficiaries of an affirmative action system that has been in place, unofficially, for many years - particularly in universities. Competency levels are appalling at all levels of government controlled activity, including the socialized health care system in Canada. There is no means of addressing this dumbing down, until the state is forced relinquish it's long-term program of social engineering.